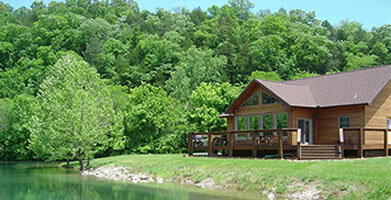 Looking for Arkansas RV Parks or White River RV Parks? Nestled in the beautiful Ozark Mountains, in historic Cotter, Arkansas, on the banks of the scenic White River...Denton Ferry RV Park and Vacation Cabin offers a friendly, relaxing, fun-filled experience for everyone. If you want to fish for the various species of trout in the crystal clear water, the fishing here is world renowned, and the facilities are top notch. Denton Ferry RV Park offers private and easy wade-in access from the park, and convenient boat access right next door. If you want to sight-see, hike, or simply take a stroll on our scenic walking trail - the natural beauty and wildlife of the area is truly amazing. We are an easily accessible campground near Cotter on Highway 62/412, in a quiet peaceful river valley away from the flow and noise of highway traffic. Denton Ferry RV Park is conveniently located close to shopping, restaurants, points of interest (such as Branson, Eureka Springs, Mountain Home, Mountain View, Norfork, and many more), and a variety of activities for the whole family. Denton RV Park, a top pick of Good Sam RV Parks, offers a clean and well-maintained facility with everything you might need to make your stay comfortable...modern facilities, beautiful natural surroundings, and a comfortable friendly environment. We are also proud to offer a beautiful log vacation cabin to accomodate groups and families. Join our family of satisfied friends and guests who return year after year. We welcome any and all RV'ers and groups!